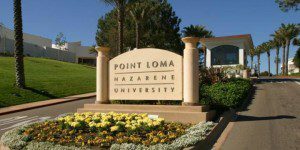 Point Loma Nazarene University was founded in the Los Angeles area by Dr. Phineas F. Bresee in 1902 as the Pacific Bible College, which would later become Pasadena College before being known by its current name. PLNU moved to its current location in Point Loma, San Diego in 1973 and began offering MBAs in 2001 at the Mission Valley campus. The school is accredited by the Accreditation Council for Business Schools and Programs (ACBSP). PLNU’s evening MBA program is located on the Mission Valley Campus. Mission Valley is situated between Mid-City and Northeastern San Diego. The campus is located in western Mission valley near the intersection of Interstates 15 and 8. The Mission Valley Campus is home to many of the university’s graduate programs. PLNU’s daytime MBA program is located at the Liberty Station Conference Center adjacent to the San Diego International Airport and a short ride from the main campus. Classes for the daytime MBA program are held at the Liberty Station Conference Center, an approximately 35,000 square foot multi-use facility with six breakout rooms and a 7,700 square foot main hall. The breakout rooms are equipped with Wi-Fi and projectors. It is also recognized as one of the more environmentally-friendly schools in the U.S., earning the San Diego Environmental Services Recycler of the Year Award numerous times. The Fermanian School of Business has 43 faculty members on staff. They have a background in a number of diverse industries including economics, micro-enterprise, finance, marketing management, and technology. A recent count showed that Fermanian has 76 MBA students, with a class size of around 20. The Fermanian School of Business offers a one-year, full-time daytime MBA degree, in addition to a 24-28 months evening part-time MBA.